Although Matrox has developed run-of-the-mill video cards in the past (e.g. the G400, a contemporary of NVIDIA’s GeForce2), they are best known for hardware that caters to the multi-monitor user. 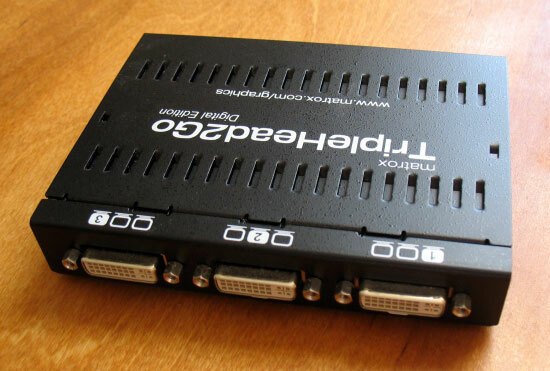 Three or four years ago the Parhelia line of triplehead graphics cards (supporting simultaneous 3D output to three monitors) caused some excitement, but ultimately the product fell short. This was because the Parhelia did not contain the raw horsepower that the contemporary ATI and NVIDIA cards did, and because the ATI and NVIDIA product update cycles were much faster. Thus, users wanting triplehead output from a single GPU were forced to buy a relatively expensive video card that became obsolete faster than they would like. While a Parhelia may have been a viable choice in 2002 or 2003, it is certainly inadequate for today’s DirectX 8 and 9 games that utilize the latest and greatest in 3D technology. However, the Parhelia provided a sense of what is possible through triplehead gaming: increased peripheral vision in-game through a wider field of view and a more immersive image that extends into your real peripheral vision. Since the stir caused by the Parhelia, Matrox has fallen off of hardware enthusiasts’ radars. They recently drew some attention again with the release of the DualHead2Go, a device designed to allow a laptop user to run dual external monitors from a single VGA port; this was not previously possible due to the lack of second monitor out connection on most laptops. The DualHead2Go also works just fine on a desktop computer, although you will probably achieve more flexibility using an actual dualhead graphics card (supporting simultaneous 3D output to two monitors). The problem with simulations and dual monitors, however (whether the monitors get their images from a dualhead graphics card or from a DualHead2Go) is that the center of the view is the most important and that is the part that gets split down the middle. Anyone who has ever tried to play a flight sim, FPS, or driving sim spanned horizontally across two monitors knows that it is an exercise in frustration and futility. 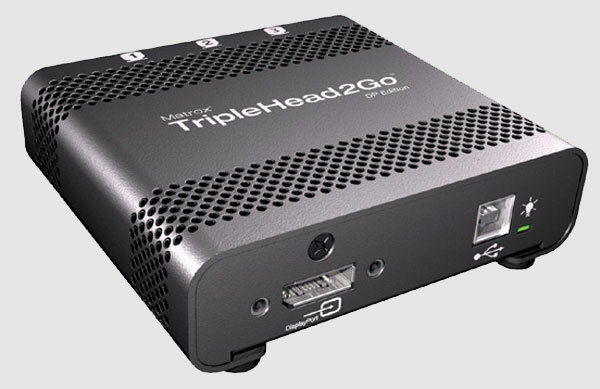 The Matrox TripleHead2Go provides an excellent method for using multiple monitors in simulations and still presenting a useable image on screen. The TripleHead2Go is based on the DualHead2Go and works in a similar manner. 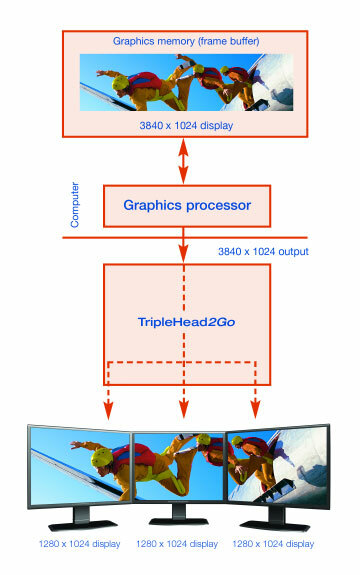 Once connected to your computer, the TripleHead2Go reports itself as a single monitor with an ultra-widescreen resolution, and the three actual monitors are connected to the TripleHead2Go.